Where are the wild places on earth, the land least disturbed by people? Which areas of the world are the most densely populated? And where are hazardous waste sites on the National Priorities List in the United States and other territories located? You can find the answers to these questions as you explore the datasets from the Center for International Earth Science Information Network (CIESIN) in the Esri story map CIESIN’s Living Atlas Contributions. CIESIN, a research center within the Earth Institute at Columbia University, has contributed six maps and datasets to Esri’s Living Atlas of the World, addressing themes such as population, conservation, air quality, and public health. 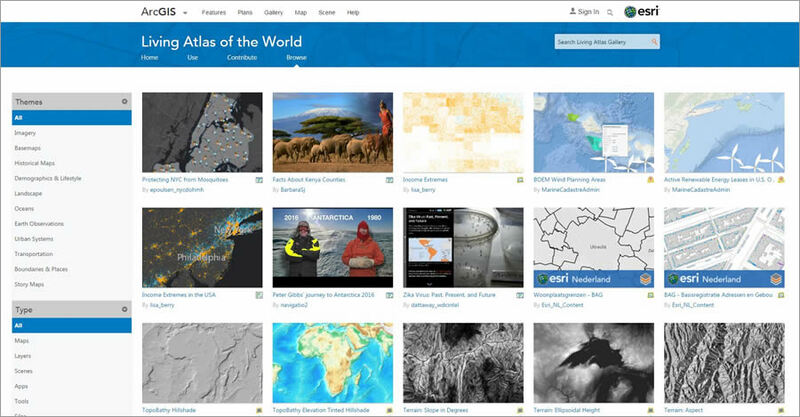 The Living Atlas of the World, hosted by Esri, contains authoritative, curated, ready-to-use content from ArcGIS Online. 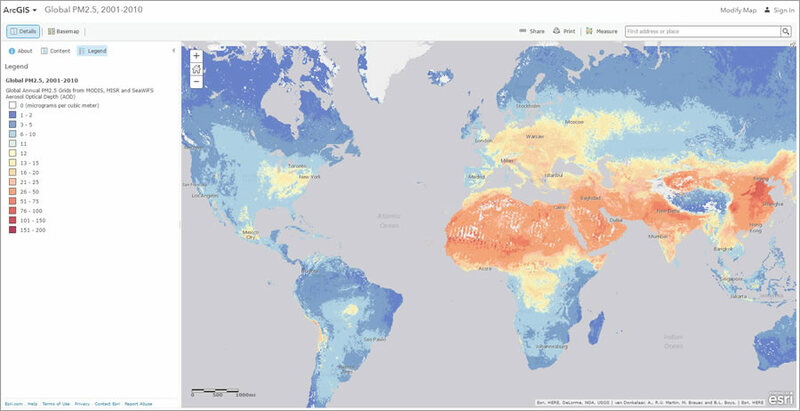 From the Living Atlas, users can conveniently access a wealth of readily available content such as imagery, base maps, historical maps, and demographics and lifestyle data from the ArcGIS platform. The Living Atlas contains thousands of valuable maps, data layers, tools, services, and apps that support geographic analysis and reporting. Organized by theme, the Living Atlas makes exploration and discovery efficient and simple. Its data is placed in a central location where users can access it and combine it with their own data for visualization and analysis. By contributing data and maps to the Living Atlas, CIESIN is sharing information about the extent of human influence on the environment. A leading organization in the development and provision of mapping tools and interactive data retrieval online, CIESIN helps scientists and researchers, in both the public and private sectors, make more informed decisions. The Living Atlas of the World allows CIESIN to reach a wider audience, including GIS professionals and the general public. This represents a unique opportunity for CIESIN to improve online communication of its data holdings and resources. “We look forward to discovering how users of the Living Atlas combine our services with other organizations’ data on the platform to examine spatial relationships and support research activities,” said Greg Yetman, associate director of CIESIN’s Geospatial Applications Division. 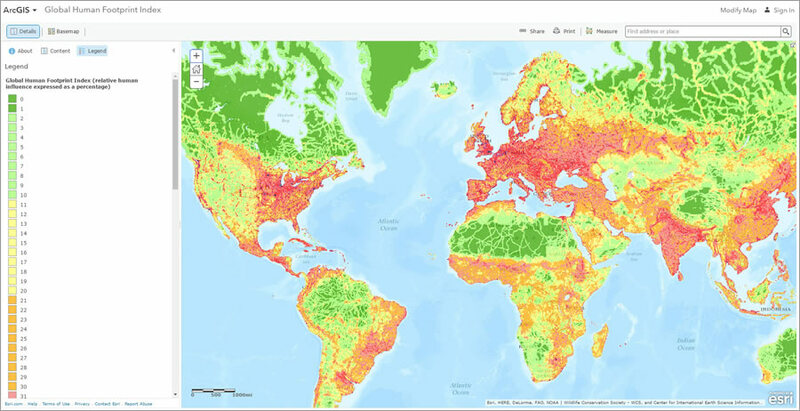 CIESIN has contributed four raster datasets to the Living Atlas. The datasets, which include layers containing information such as the Human Footprint Index and hazardous waste sites throughout the United States, focus on human interactions with the environment. One dataset CIESIN has shared in the Living Atlas, UN-Adjusted Population Density 2015, is from the fourth version of CIESIN’s flagship data collection, Gridded Population of the World (GPWv4). The gridded format allows GPWv4 to be easily integrated with a wide range of data, supporting research, planning, and applications in vulnerability mapping, disaster impacts, and the health dimensions of environmental change. Another example is the Global PM2.5 dataset, which measures satellite-derived estimates of ground-level concentrations of fine particulate matter 2.5 microns or smaller in diameter, the most harmful class of air pollutants. Scientists have used the dataset to research the effects of air pollution on human health. Exposure to fine particulate matter is particularly harmful, as it can make its way deep into people’s lungs and may lead to respiratory and cardiovascular diseases, resulting in increased morbidity and premature death of young children, the elderly, and those already suffering from these types of illnesses. The story map also displays the Last of the Wild, v2 dataset. 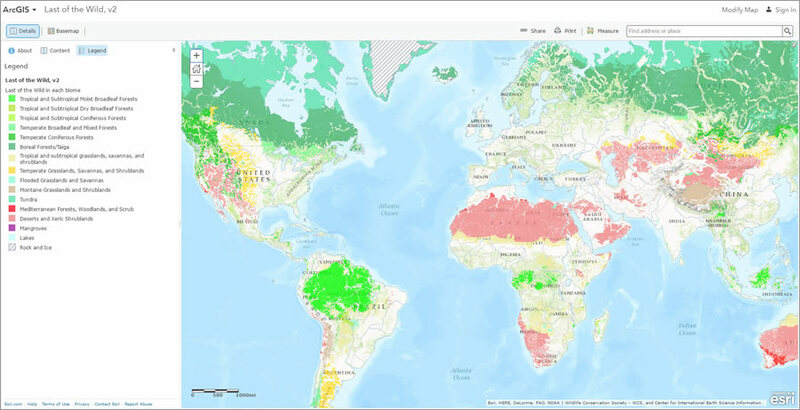 This map displays wild areas, or the areas of least human influence, within major terrestrial biomes based on the Human Footprint Index dataset, another dataset contributed by CIESIN. A biome is a region with distinct characteristics defined by climate and dominant vegetation, occupied by a community of plants and animals. The Last of the Wild dataset may be used to inform wildlife conservation planning, natural resource management, and research on interaction between humans and the environment. The dataset has been used to measure local extinction of native species, including assessing invasive plants in China and helping to predict how climate change can affect the spread of the Schistosoma mansoni parasite in eastern Africa. The datasets from CIESIN help people solve real problems that the world faces today. Many are used in conservation activities such as determining which land should be preserved and conserved and for developing environmental protection policies. Human health is another area where this data is used extensively. For example, the Global Roads Open Access dataset has been used to show the areas of the world where people are not receiving needed vaccinations. Contributions to the Living Atlas support the diverse and significant work of the GIS community at large to address global and regional challenges. Content can be contributed through the Living Atlas Contributor app. 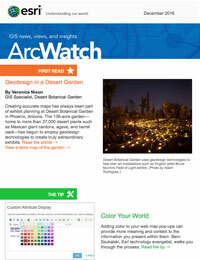 This app assigns a score to each of your ArcGIS Online items based on properties such as the item’s title, summary, and description. To learn more, visit Living Atlas or its Facebook page.